Katerynoslav gubernia [Катеринославська губернія; Katerynoslavska hubernia]. An administrative-territorial unit in Russian-ruled Ukraine. Katerynoslav (Russian: Ekaterinoslav)—today Dnipropetrovsk—was the capital. In 1764 New Russia gubernia had been created to administer much of Southern Ukraine, including the lands of the Zaporozhian Host after the destruction of the New Sich in 1775. It was replaced by Katerynoslav vicegerency in 1783 but was reinstated in 1796. 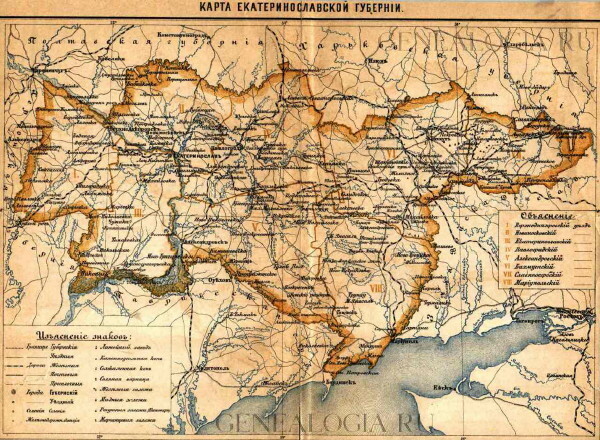 In 1802 its territory was divided among the newly created Mykolaiv gubernia (from 1803 Kherson gubernia), Tavriia gubernia, and Katerynoslav gubernia. Katerynoslav gubernia consisted of Katerynoslav county and Verkhnodniprovske county west of the Dnieper River, and Bakhmut, Novomoskovsk, Oleksandrivske, Pavlohrad, Slovianoserbsk, and Rostov-na-Donu counties east of the river; in 1874 Oleksandrivske county was divided to create Mariupol county, and in 1887 Rostov-na-Donu county was transferred to the Don Cossack province (see Don region). The gubernia's population was 662,000 in 1811, 902,400 in 1851, 1,204,800 in 1863, and 1,792,800 in 1885; the vast majority were peasants. From the second half of the 19th century the gubernia was the coal-mining and metallurgical center of Ukraine, incorporating the Dnieper Industrial Region and the Donets Basin. Consequently its population multiplied, increasing by 1897 to 2,113,700 (69.5 percent Ukrainian, 18.2 percent Russian, 4.2 percent Jewish, 4 percent German, 2.3 percent Greek, 1.1 percent Tatar). In 1924 it had 3,424,100 (13.6 percent urban) inhabitants, living in 5,165 settlements, 36 of them cities and towns; close to half were non-Ukrainian, and the largest social category was that of workers (25 percent). Under Soviet rule the gubernia was abolished in 1925, and its territory (76,912 sq km) was divided among seven okruhas: Katerynoslav, Oleksandrivske, Berdiansk, Zaporizhia, Kryvyi Rih, Melitopol, and Pavlohrad.